A drive slightly downhill to a right to left sloping fairway with bunkers on the right and one strategic pine tree on the left. Following a good drive to the left centre of the fairway, the second shot is a short iron to a slightly raised green, with bunkers left and right. The drive is across a depression, with a right to left fall and bunkers on the right, to catch the ball, which is started a little too far to the right. The second has plenty of room, but needs to be left of centre of the fairway, to allow easy approach to a green bunkered on the left and with a trap on the right cutting across the front of the green. The third offers a generous fairway to hit at, but a drive on the centre right of the fairway will follow the right to left slope to give the easiest second shot. Too far right and pines can block the second shot. Too far left and the ball can run down a steep bank towards the lake, which runs down the left side of the fairway and ends just 25 metres from the front left half of the green. The green is raised and a short second can roll back into the lake. A trap on the right catches those fearful of the water on the left. A flat par-3 to a green raised one metre above the fairway, rapped left and right. The shot is played with a mid or long iron and needs to be hit right up to the flag. It is easy to underestimate the length of this short shot. 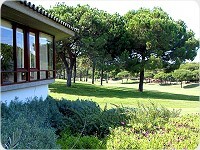 Another of Quinta do Lago's great par-5 holes. The drive, to a left to right sloping fairway is trapped both sides at 220 metres. Trees and then out of bounds on the both sides, prevent a wild tee shot. 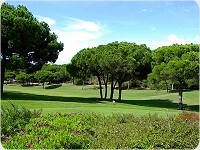 A large clump of trees eating into the left side of the fairway at 400 metres, pushes the player right toward another group on pine trees at 470 metres. The green is raised and has a large frontal trap and another one to the right. A long pine guards the left of the green. A good hole for a player with a controlled draw shot. An uphill dogleg left with a bunker on the left at the turn point. The fairway rolls left to right and a draw shot into the hills sets up a short iron to the elevated green which is bunkered left and right. The length of this (apparently) easy second shot is hard to judge. A slightly downhill fairway with a mid or long iron, to a green trapped left and right. The wind has an effect on this open par-3. A very testing tee shot to a severely right to left sloping fairway. A clump of trees starting at 200 metres on the right demands a long power fade down the centre of this fairway to set up an easy second shot. The second with a mid-iron is uphill to a green cut into a bank with a trap on the left. It is a paramount to carry the ball onto this green. Driving across a dip with bunkers left and right at 230 metres demands accuracy. The hole turns slightly left and uphill to a green level with the fairway. The short iron second must be pitched well up to avoid bunkers on the right and the tendency to hook must be resisted as the green falls away steeply on the left. A countered green demands good judgment and touch to avoid making a three putt. A testing opening par-4 hole. The landing area for the drive is fairly generous but a trap on the left and pine trees on the right can punish a wayward shot. The second across a dip is a matter of length judgment. The green trapped left and right is long and it is easy to leave a long putt. A downhill par-3 that becomes very testing when the winds blows. Normally a mid-iron shot to a green trapped left and right. The view from the tees is well worth a moment of contemplation. A precision driving hole if one wishes to make an easy par or a birdie. The ground falls right to left as the hole swings left to right round a ninety-degree dogleg. Bunkers left and right on the corner of the dogleg add to the demand for length judgment with accuracy. The second (up a hill to a generous plateau), is no problem until one strays from the fairway. The land falls away sharply on both sides. The green is trapped right and left and tends to be very fast when putting from the back to the front of the green. A right to left dogleg with a right to left slope. A bunker on the left of the dogleg and trees right and left catch the errant drive. After a good drive it is just a short pitch to a slightly elevated green and, hopefully, a birdie. A testing tee shot when the wind blows. The tee is elevated 25 metres above the fairway and a ball with slice or hook spin can be adversely affected. A trap on the left at 240 metres awaits a draw. A tee shot in the centre right of the fairway leaves a mid-iron to a green, trapped left and right. One of golf's most photographed holes. A carry of some 80 metres across a lake to a green with a trap on the left and trees on the right. Requires a good long iron or a wood if the wind blows. A good driving hole. A drive down the centre right of fairway, sets up an easy approach to a sunken green. Sand and trees trap any drive hit too far left. A steep bank to the right of the green allows latitude for a pushed second. Left here is a disaster! Another picturesque tee shot with lakes left, right and in front. A long straight drive leaves a second shot to a generous fairway, where left is better than right. The pitch is to a green trapped left and right and slightly elevated above the fairway. The green has some interesting contours which can make a birdie difficult. A very testing finished hole. The long hitter can try to carry the bunkers on the left but they must beware of running out of room on the right, as the hole doglegs to the left. The second is to a slightly elevated green trapped left and right.